Place the zucchini and onion in a large, non-metallic bowl, and sprinkle the salt overtop. Use your hands to evenly mix the salt throughout the zucchini. Cover, and refrigerate overnight. The following day, drain the zucchini in a colander, and rinse well with cool water. Squeeze out excess water and set aside. Place the red and green bell pepper, sugar, vinegar, and cornstarch into a large pot. Add the nutmeg, turmeric, celery seed and pepper. Stir to combine, then add the drained zucchini. Bring to a boil over medium-high heat, then reduce the heat to medium-low, and simmer 30 minutes. Meanwhile, sterilize 7 one-pint jars and lids to hold relish. 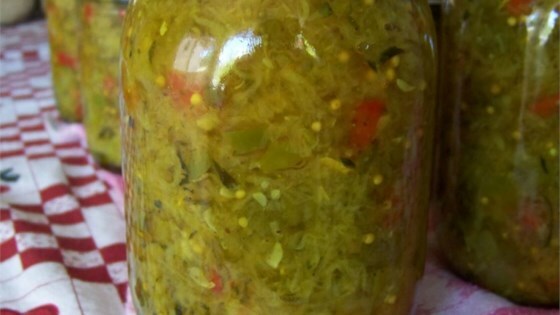 Pack relish into sterilized jars, making sure there are no spaces or air pockets. Fill jars all the way to top. Screw on lids. Love it! I did make a couple changes though. I used apple cider vinegar instead of white vinegar and left out the cornstarch. I will use this recipe again!